A Quebec father has launched a class-action lawsuit against McDonald's, alleging the company's Happy Meals break strict provincial laws against advertising to children. Since its debut in 1979, the Happy Meal has been a staple of McDonald's menu and a go-to meal option on family road trips. But some Canadian parents are decidedly unhappy about the hold the fast-food empire has over their children's stomachs. Antonio Bramante is the lead plaintiff in a newly certified lawsuit that alleges McDonald's is unlawfully aiming advertising at children under 13 years of age. That would violate the province's strict youth consumer protection laws. Mr Bramante, a father of three young children, says he eats at McDonald's about once every two weeks on the urging of his children, according to the court documents. He estimates he has spent hundreds of dollars on Happy Meals, which are children's meals that come with toys. The Quebec father says the toys are often linked to popular film releases and his children often want to return to the restaurant so they can complete their set of toys. He also claims the restaurant is directly targeting children by displaying the Happy Meals toys at their eye level. "In today's world, parents have to choose their battles. And what's the easiest thing to give into? It's to feed your children," says Joey Zukran, the Montreal-based lawyer who filed the class action on Mr Bramante's behalf. Quebec prohibits marketing to children under the age of 13, making it one of a handful of jurisdictions in the world to essentially ban all advertising geared towards children. The province has also had a law since 1980 that restricts marketing unhealthy food to children. "McDonald's has a legal obligation to respect that law and they're not, in Quebec at least," Mr Zukran told the BBC. There are three exceptions, with conditions, to Quebec's advertising law: for ads in children's magazines, for promoting a children's entertainment event, and for advertising via store windows, displays, containers, packaging and labels. Mr Zukran says he is ready to argue McDonald's is not covered by any of these exceptions. A Quebec court judge issued a ruling certifying the lawsuit last week. Anyone who purchased a McDonald's Happy Meal in Quebec from November 2013, even if they are not Canadian residents, can request to be part of the class action, Mr Zukran says. It seeks both compensatory and punitive damages and an order to prevent McDonald's from continuing the alleged practice. McDonald's has about 300 restaurants in the Canadian province. In a statement, McDonald's Canada told the BBC it has received the ruling certifying the lawsuit and plans to examine it carefully. "We are aware of our obligations under Quebec's advertising laws and reiterate that we do not believe this class action has merit," it said. 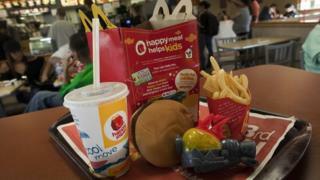 McDonald's is one of the world's biggest distributors of toys in the world, driven in large part by Happy Meals sales. This is not the first time the Happy Meals toys have been the target of a lawsuit. In 2015, the US Children's Advertising Review Unit, a self-regulatory body, advised the company to focus its advertising on food and not its Happy Meal toys. The company agreed to take the advice into consideration for future advertisements. In 2010, the restaurant chain faced a charge that its advertising violated California consumer protection laws. The lawsuit, filed by the Center for Science in the Public Interest, a nutrition advocacy group based in the US, was eventually dismissed. The claim that the company exploits children in advertising also made its way into the longest court case in UK history. The "McLibel" case pitted the fast-food empire against two Greenpeace activists who had distributed leaflets entitled "What's wrong with McDonalds - everything they don't want you to know"
It is estimated McDonald's spent millions in legal fees suing the couple for libel. The couple defended themselves after being denied legal aid. In 1997, a judge ruled in favour of McDonald's, but found the leaflet's claim that the company exploited children in advertising to be true.